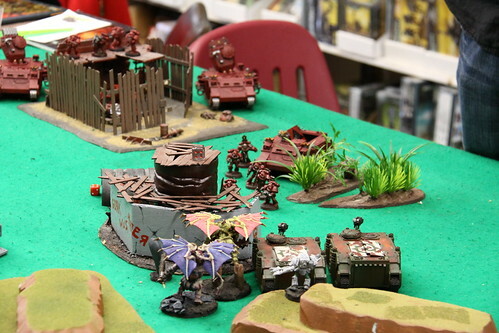 Editor: Anthony Wang put together a batrep from the 2/20 tournament that we organized . He piloted Chaos Space Marines. (: it was great fun! went really smoothly and finished early…amazing! thanks to Nash and Shep for running it! Turn 4 DG: meltas kill deffcopta, melta squad shoots wagon and blows it up. 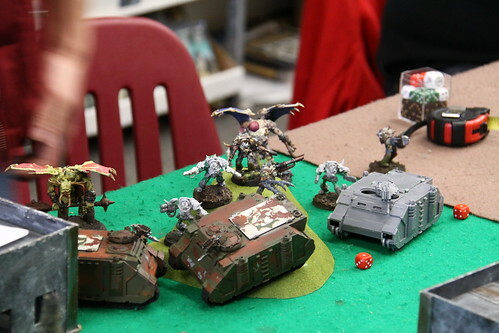 Oblits kill lots of orks with PC. DPs charge lootas, wipes them out. melta squad charges remaining orks, killing them. Turn 3 DG: both princes charge tact squad near center and wipes it. PM moves to capture objective. oblits shoot PC at emp’s champ squad, killing 1-2 marines. i basically rolled under odds towards the end of both games and couldnt kill the horrors in CC and couldnt dislodge the venerable dread despite a rain of melta fire. I had a great time despite my mistakes, a great learning experience! 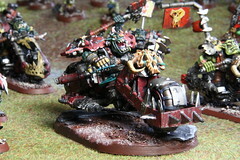 I have recently been considering starting an Ork army. I started before the FAQ update regarding the use of Deff Rollas, and was initially considering a heavy bike list. I have had the fortune of obtaining some Biker Nobz and had a friend paint them up. However, I knew this list was more of a novelty list and not really a consistently competitive list and wanted to fill it out with Lootas, Wagons, and more, but the new FAQ sort of forced me to change my line of thinking. I have been asking myself, how do I create a fun, story driven, competitive Speed Freak army? My initial thoughts center around 3 Battlewagons with Deff Rollas, Red Paint Job, Boarding Planks, and Grabba Klaws. With Wazdakka and a KFF Big Mek as part of that core. The rest would be filled out with Lootas, Bikes, Boyz, and I might try to wedge in a small Nob Biker squad. Still just thinking out loud, but its approaching my time for a new army.